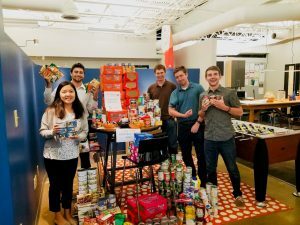 The 2018 summer interns at Dublin, OH-based Infoverity have wrapped up the First Annual Infoverity Summer Intern Service Project, collecting 1363 cans in a 30-day Food Drive to benefit the Dublin Food Pantry. Founded in 2011, Infoverity is a leading global professional services organization focused on solving business problems caused by the proliferation and diversification of data in large enterprises. Infoverity is featured in Gartner’s Market Guide of MDM External Service Providers, is among the Inc. 5000 and the Columbus Fast 50, and is named among the Best Places to Work in IT by IDG’s Computerworld and Columbus Business First. Infoverity provides Master Data Management (MDM), Product Information Management (PIM) strategy and implementation, data governance and analytics, managed services and hosting solutions that help clients in the retail, consumer goods, manufacturing, financial and healthcare sectors to simplify and maximize the value of their information. Infoverity’s global headquarters is in Dublin, Ohio, and additional service and support teams are located in Spain, Germany and Russia. For more information, contact us here and follow @Infoverity on Twitter.